This basic set-up from a short story by Joe R. Lansdale would be enough for an interesting little movie. And indeed, writer/director Don Coscarelli spends a decent amount of time in Bubba Ho-Tep exploring this icon left with nothing but his regrets. That he may actually be Sebastian Haff is quite possible; in some ways, this plays like Jonathan Demme’s loopy and almost forgotten Melvin and Howard, with a perennial loser believing a fantastic story about himself when nobody else will. But we want to believe, even when Coscarelli adds another layer. The only denizen of the home who gives “Sebastian” any credence is Jack (Ossie Davis), an elderly black man. Though he validates Elvis, Jack himself has a specious history, as he claims to be John F. Kennedy, dyed black and hidden away in Texas so nobody would ever learn the truth. Oh, yes – he also has had a portion of his brain replaced by a sandbag with the original piece of grey matter being controlled from a secret lab in Washington, D.C. Even with this, you could just the movie as a quirky look at letting go the dreams of youth while wallowing in the sunset years. If you want to get even more lyrical, Coscarelli could be examining the enduring power of American myth. Indeed, though not prominently featured, there’s another resident (Larry Pennell) running around (well, hobbling, really) who believes himself to be The Lone Ranger. Coscarelli, however, is not just another quirky little filmmaker. He has a certain cult cache around him, like his star Campbell, for having created the Phantasm and Beastmaster franchises. Like any artist, he may be interested in the little things that we all have in common, but he can’t let it go at that. So we have a soul-sucking ancient Egyptian mummy stalking the halls at night. Inexplicably dressed like a spaghetti western-era Eastwood, this “Bubba Ho-Tep,” as Elvis dubs him, feeds off the residents, sustained by their flickering life energies. How he got there isn’t important, even though the script sort of explains. What really matters is that this will give Elvis and JFK a last shot at glory. 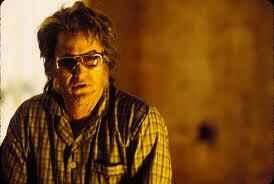 A bizarre high concept, Bubba Ho-Tep turns out to be surprisingly moving. Much of this can be credited to Campbell, an underrated actor to most of the public, who may not have been an obvious choice to play Elvis. Once you see him, though, you completely give over to the illusion. He plays a man hugging tightly to the tattered vestiges of his persona as infirmities overtake him. Regrets quietly sit on his face. Davis doesn’t fare quite so well, but he plays Jack with dignity. As written, the role is more an excuse to provide exposition, as it seems the former President spends just as much time studying Egyptology as he does his assassination. At no point does Davis try to convince you he really is Kennedy with a labored accent. He just is who he is, and the scar at the base of his neck just might mean he’s telling the truth. What this film really accomplishes is an exercise of true filmmaking imagination. A simple but cool idea gets played for all its worth, without much flash. Occasionally a special effect occurs, but very primitively by today’s big budget standards. Coscarelli, thank heavens, comes from a time when you had to be creative in figuring out how to do something on camera instead of taking care of it all in post-production. It may look a little more rough, but it somehow makes the film all the more charming. 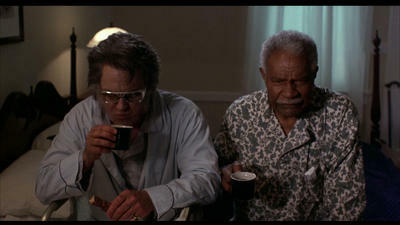 Bubba Ho-Tep isn’t perfect, moving at a pace appropriate to its characters’ ages. But it’s earnest fun that manages to sneak more than a little poignancy in with its supernatural doings. I’d take this mummy over The Mummy any day.